The Brick Castle: LEGO Minifigures Series 14: Monsters - The Halloween Edition! 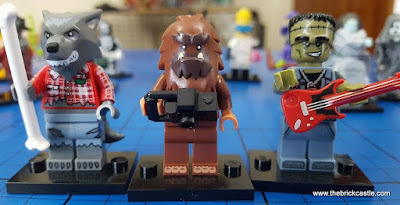 LEGO Minifigures Series 14: Monsters - The Halloween Edition! Lets start with the definite non-monsters. These are dressed up! They are in their Halloween trick-or-treat costumes. The Skeleton Guy and Plant Monster are clearly 'people' underneath, you can tell by the eyes. We're split here on Tiger Woman, but I think costume. 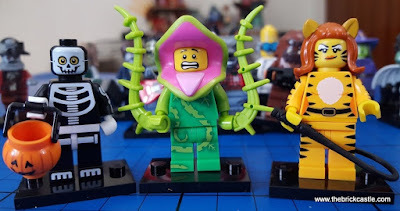 There's some lovely printing in this series of minifigures and these 3 make good use of the all over print, although Plant Man has no side print. 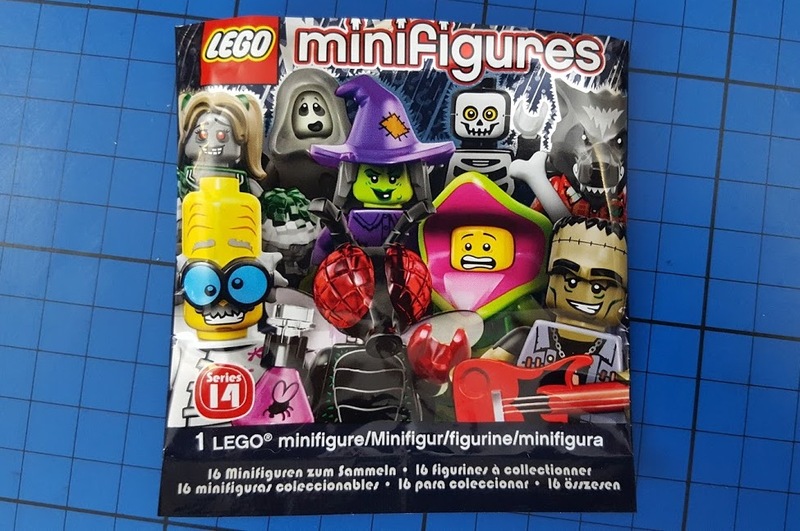 I love the skeleton and his tiny pumpkin bucket is perfect. Next two characters who definitely go together! 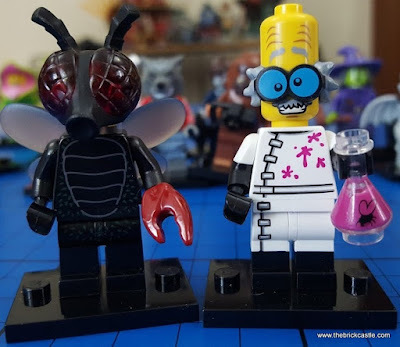 The Crazy Scientist obviously had a hand in creating the Fly Monster - the evidence is right there in his bottle! No back or side print on these, but fantastic enlarged heads and the Fly Monster's claw hand and wings make for interesting figures. Who doesn't love a good Crazy Scientist? I think it would be a bit of a heavier band than the Foo Fighters, probably more Queen's Of The Stone Age, with a little more howling than your usual track. Next the backing singers! Adele and Paloma Faith have never looked so good. 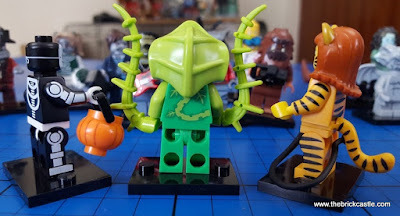 The Spider Lady is actually my favourite of the Series 14 minifigs - her 2 part plastic cape is awesome. 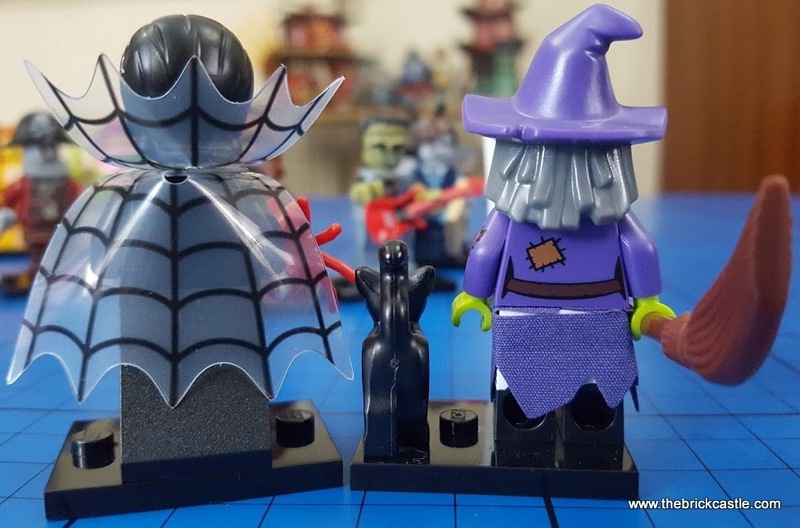 The Wacky Witch is really well done, lovely hat. 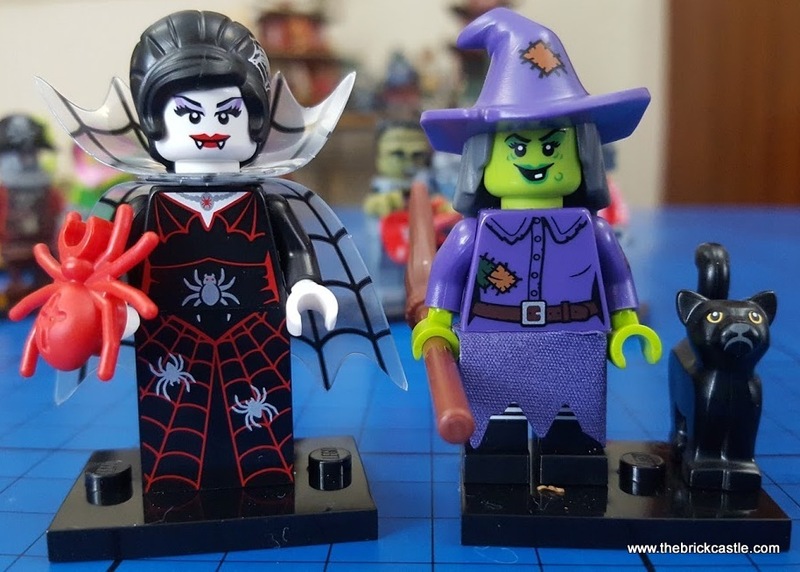 No need for rear print on the Spider Woman, and minimal on Wacky Witch - nice to see the return of the broomstick (I kind of miss Harry Potter LEGO). These must be the roadies - I guess the ability to fly is helpful for light rigging. Banshee, Gargoyle and Spectre (sadly not Phil Spector, he could have produced the new album). 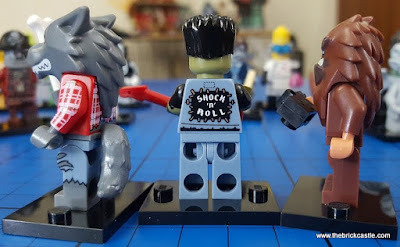 These minifigures are very special. 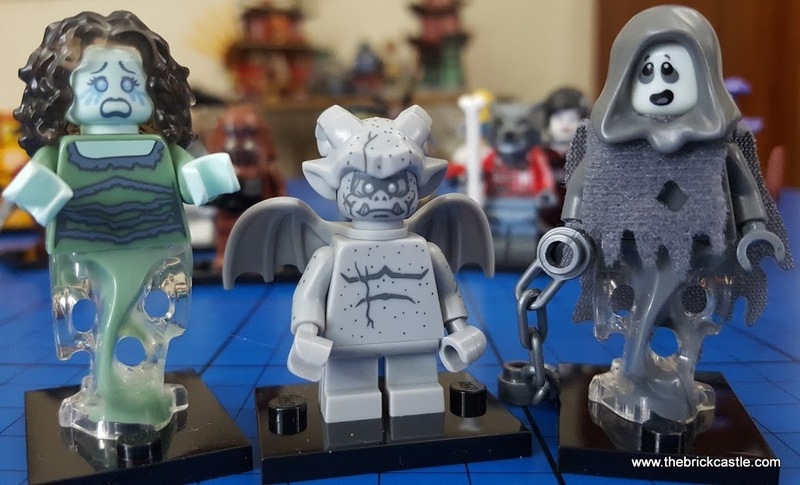 The Gargoyle is going to be very popular with anyone who builds the modular houses, he's a perfect addition to your rooftops. I love the Spectre's cape - it's a type of felted material that really allows for fine cuts while keeping shape very well and it lies very nicely over the minifigure's shoulders. 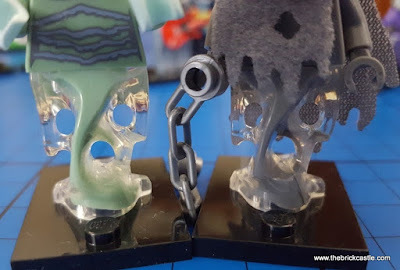 Banshee and Spectre have the new translucent bases which are divine. The 2 tone colour really is something else and in fact the Banshee's hair is from the same style of plastic, so she has an all over eerie glow. The 3 zombies are definitely your traditional late night gig crowd. 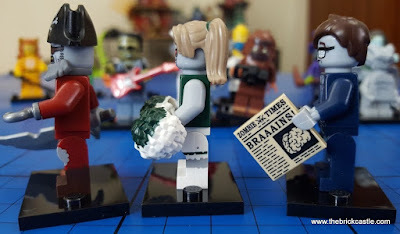 Zombie Pirate, Zombie Cheerleader and Zombie Businessman are all excellent characters. Zombie Businessman is my favourite, his hair is fantastic and his wonky broken glasses and yellowed 'financial' paper are great touches. No exciting rear prints on these, but the Zombie Pirate and Zombie Cheerleader have side print again, and how great is her hair? Britney Spears circa 1998 meets The Walking Dead. 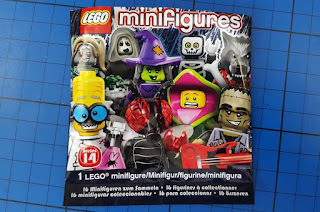 LEGO Minifigures are available for £2.49 each in blind bags. We're lucky enough to have a friend who doesn't mind sitting for hours on end sorting through to find a complete set - cheers Brett! Love these! Tiger lady is definitely dressed up. Her tiger print is a different colour to her hands and face I love the banshee. 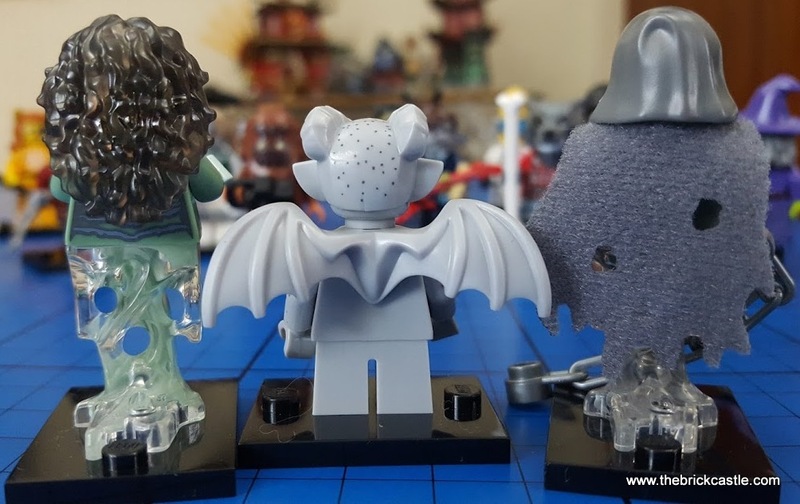 I think I might need to go on a blind bag feeling trip to find one. They really are fab, I've not really caught on to the mini figures but looks like I really should. Monkey would love some of those. Wow these are awesome. My son would love them. My son thinks that they're fab too!